HGA was hired by the Tulsa City-County Library System to analyze, evaluate and immerse ourselves in the physical, operational; and services of the existing libraries to create a set of recommendations for delivering service for the years to come. 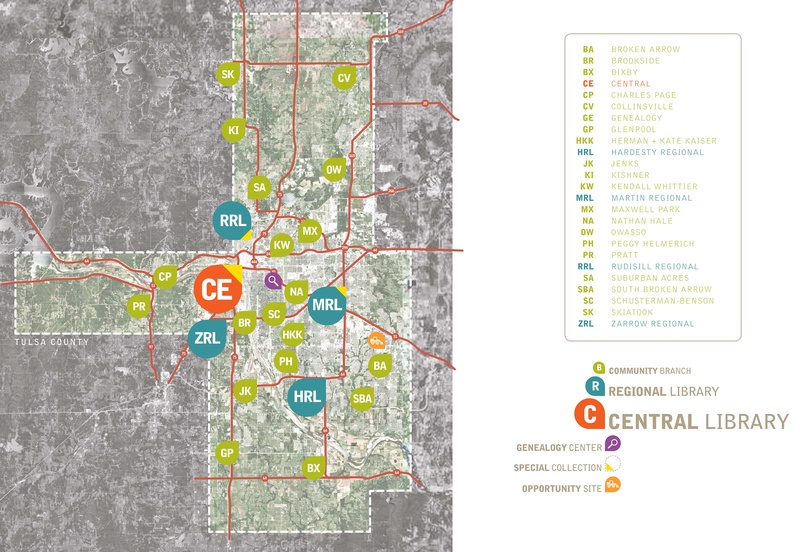 TCCL system consists of a large central library, four regional libraries, 19 branch libraries, a Genealogy Center and Support Services Center all located throughout Tulsa County, Oklahoma. HGA teamed with Library Futurist, Joan Fry Williams, to work with representatives of the Tulsa City-County Library and Board to evaluate the metrics and service patterns of the current state and develop recommendations to create the vision and framework for the future state of the system. Physical assessments included the efforts of team member, The Boldt Company to evaluate the current state of each physical location. The team worked with TCCL to establish the criteria to be used for the physical inspection as well as the experiential evaluation. Each physical assessment included observational research regarding the physical site, building interior and LEED criteria. Experiential criteria measured features such as quality of natural light, wayfinding and human centered design features. Public meetings were held with local business leaders to gain insight into the Tulsa area and the role the library plays in the region now and the role the library should play in the future. Efforts also included meetings with staff at each facility, community engagement, peer benchmark and demographic analysis. Listening to the needs of the patrons provided insight into the unique qualities of each neighborhood as well as provided insight into the services required for each community. HGA’s industrial engineers worked with the design team to assess at each location, the system wide processes related to material handling, sorting, weeding and donations to identify opportunities for improvement. Understanding current processes informed discussions related to suggested improvements for the use of technology, material handling and future staffing requirements. The already “lean” central material handling facility was integral to system wide efficiency. The final Facilities Master Plan document was presented to staff on Staff Development Day and approved by the Library Commission. The Facilities Master Plan document includes the site, building, LEED and process assessments, analysis, ideal planning diagrams for each neighborhood (small), community (medium), regional (large) library and outlines the service recommendations for the Tulsa City County Library through 2027 including the quantity of libraries, location criteria, the types of facilities needed and the associated service model changes which will best serve the Tulsa City-County Library community for the future.